Download and Unzip to any directory. To use Chilkat in an Android project, the Java classes and shared libraries should be copied into the project's directory structure. The Chilkat Android download (chilkat-9.5.0-android.zip) has this directory structure. Note: Starting in v9.5.0.76, the armeabi, mips, and mips64 libs are no longer included. The directories under libs (in the Chilkat download) will be copied to the jniLibs directory in the Android Studio project. (You'll likely need to create the jniLibs directory.) The chilkatsoft directory will be copied to the com directory in the Android Studio project. 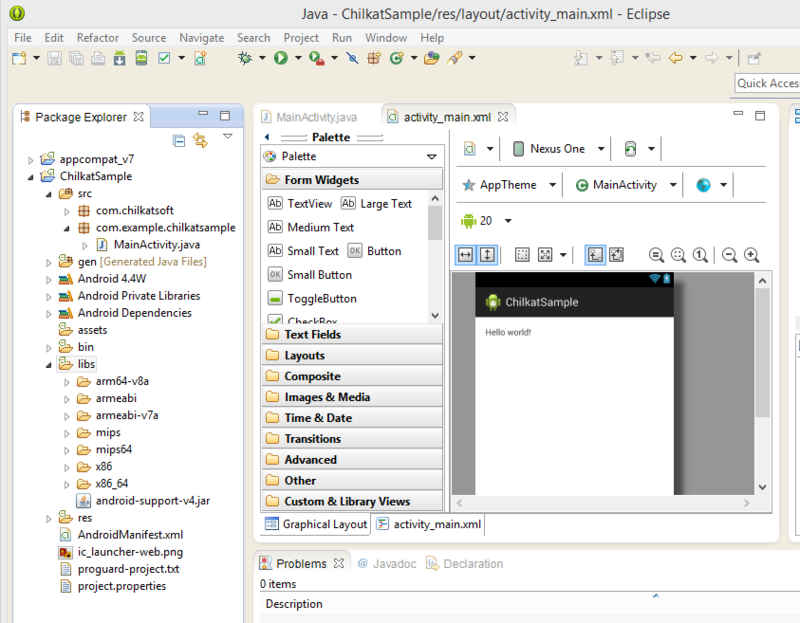 Here is a snapshot of the sample Android Studio project showing the locations of the jniLibs and chilkatsoft directories. The Chilkat-related code is shown in boldface below. The Chilkat shared library must be loaded via System.loadLibrary when the application starts. // shared lib is libchilkatcrypt.so, then pass "chilkatcrypt" to System.loadLibrary. The Chilkat Android library supports Android Platform 2.0 (API Level 5) and above. If the incorrect library name is passed to System.loadLibrary, then you will see the following error message at application startup: "The application <your-application-name> has stopped unexpectedly. Please try again."